Christmas is an exciting time of year, but there is no doubt that in the run up to the special day that a lot of waste is produced at home. It is a busy time too, and cutting out numerous. impractical and unnecessary trips to the local waste disposal centre could really make your Christmas a lot more stress-free. At Adlington Skip Hire and A1 Skip Hire, we’re here to help! Why have a festive clear out for Xmas? Christmas usually means presents…and trying to find space for all those new gifts can be difficult. Having a clear out before Santa Claus pays a visit means that organising your home after Christmas is much easier, with plenty more space to put the toys. You may be having guests to stay with you, but the spare room is floor-to-ceiling with unneeded clutter. A skip will make this daunting job much simpler, letting you concentrate on the more important aspects of Christmas planning. You want your home looking its best for the festivities, and you are planning to do some house improvements or DIY. Our skips can be filled with many types of waste products, including most building materials, and we will provide drop-off and collection types to suit your project. Hiring a skip from us is easy, free from hassle and much more affordable than you may think. All you need to do is place your waste inside, we take care of everything else. Take a look at the different sizes we have available, there is certain to be one to meet your needs. If you’re unsure which one would be best for you, we will be more than happy to help. A home free of unwanted waste is an ideal way to start the New Year. A tidy home means a clear mind, and the festive period is the perfect time for new beginnings. We offer same day and next day skip delivery if required, which will make your plans for a perfect family Christmas achievable sooner than you think. Make your resolution today! 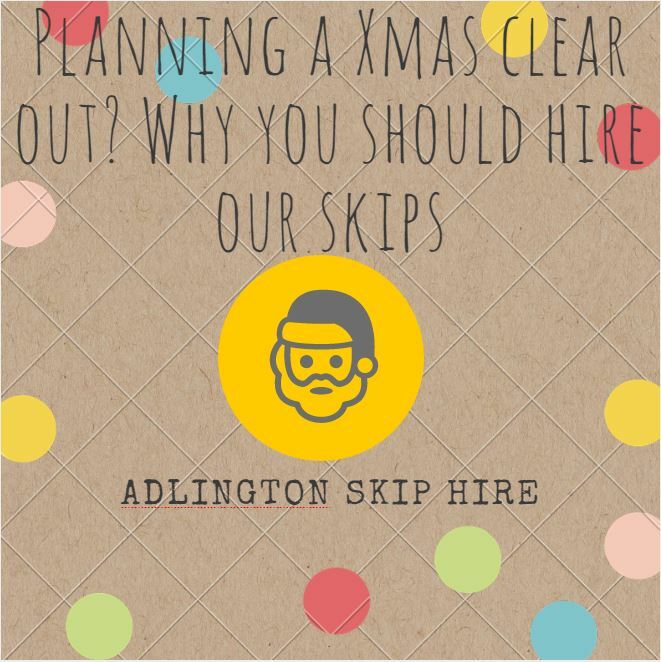 If you think we can help you, or if you any any further questions, please get in touch with Adlington Skip Hire or Wigan Skip Hire, we would be pleased to hear from you.